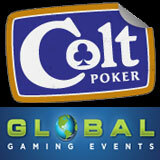 Global Gaming Events is hosting its second set of events in its three-month partnership with Colt Poker. On Saturday, March 24th, 2012 at 3:00pm EST there is a $1 + $0.10 buyin poker tournament with $500 added to the prize pool. $2,500 will be added to the $5 + $0.50 buyin tournament the very next day, Sunday, March 25th, 2012 at 3:00pm EST. These events are open to any player who has a Colt Poker account and who pre-registers with Global Gaming Events. Pre-registration is open now and closes on Saturday March 24th at 1pm EST. These are password events, but pre-registered players will receive the password early via email. All pre-registered players that have made deposit on Colt Poker before Saturday, March 24th, 2012 at 3:00pm EST, and that play in both of these OFC Buyin Tournaments will receive $10 FREE! There will also be prizes for the best performing communities. Players that wish to earn points toward the community competition must pre-register their details at www.GlobalGamingEvents.com after making their Colt Poker player account.